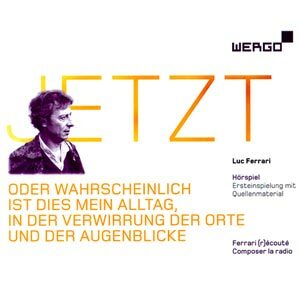 Triple CD on Wergo around the Jetzt piece by Luc Ferrari. CD1 and CD2 include “JETZT” as “radio play on the radio play”, a special case between music, radiophonic art and narrative radio play. CD3 includes new works based on the Jetzt materials by Tiziana Bertoncini, Antje Vo­winckel, Frank Niehusmann, David Fenech, and Neele Hülcker. Interviews of Luc Ferrari are also included + a 76 page booklet.